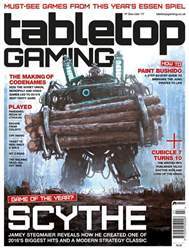 Not had enough of Cry Havoc? Good, because publisher Portal Games has announced the first expansion for Grant Rodiek, Michal Oracz and Michal Walczak’s sci-fi strategy hit. Cry Havoc: Aftermath adds three structures and five skills for each of the game’s factions, almost doubling the number of abilities available. There’s also an alternative game mode, which is said to guarantee stretching gameplay to all five rounds. A new scoring system has been tweaked to provide more victory points when passing an event token instead of removing it.